As every year we are very happy to announce the top winning retrievers of the Lithuanian retriever club! We are happy to announce top winning Lithuanian retriever club dogs of 2012. We thank all enthusiasts of the retriever breeds participating in shows in Lithuania and abroad. 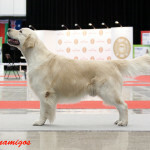 The results of all retrievers which information was sent to us are posted.